Loire Valley (French: Vallée de la Loire) is known as the Garden of France. A favourite destination for family vacations. Imagine cycling down the flat roads beside the graceful River Loire exploring all the chateau along its banks (you might want to visit some of the vineyards and sample a glass or two of Sancerre or Vouvray). There are many hotels en route - use a map / guide to plan your trip in advance to locate the many chateau open to the public. There are many online resources to help. It is also noteworthy for the quality of its architectural heritage, in its historic towns such as Amboise, Angers, Blois, Chinon, Orléans, Saumur, and Tours, but in particular for its world-famous castles, such as the Châteaux d'Amboise, Château de Villandry and Chenonceau. The landscape of the Loire Valley, and more particularly its many cultural monuments, illustrate the ideals of the Renaissance and the Age of the Enlightenment on western European thought and design. The Loire Valley is an outstanding cultural landscape of great beauty, containing historic towns and villages, great architectural monuments, its many châteaux, and fine wines. On December 2, 2000, UNESCO added the central part of the Loire River valley, between Maine and Sully-sur-Loire, to its prestigious list of World Heritage Sites. The world-famous Cathedral of Chartres which Rodin called the Acropolis of France, is a remarkable testament to medieval architecture. Orleans - Once France's second largest city and now the vinegar capital of France. The city features the Hotel Groslot, a brick and stone Renaissance mansion which served as the Town Hall, and the Gothic Cathedral of St-Croix. Blois with its famous castle has been linked throughout the centuries to the history of the Kings of France. Chambord - the largest of all the Loire Valley castles, this magnificent Renaissance edifice, built by François I, is surrounded by an immense park. Tours - At the junction of the Loire and Cher Rivers, Tours is a busy university town and boasts wonderful Renaissance and neo-classical mansions, which are clustered around the famous Plumereau square. 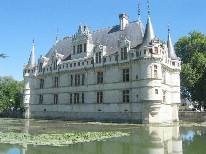 Enjoy a holiday in the Loire Valley - you can travel through the regions of Western Loire (Pays de la Loire) and Centre explore the many chateaux!